The third Monday in September is Respect-for-Senior-Citizens Day. The day was originally celebrated on September 15th, but it was moved to the third Monday in September in 2003. There was an article about a proponent of the day in the paper(The Asahi Shimbun) yesterday morning. A mayor at Nomatani village (now Takacho) in Hyougo Prefecture presented a peasant kabuki play to show respect for the villagers 55 years of age or older, who have contributed to society for many years in 1947, when the average life-span was 54 years for women and 50 years for men in Japan. He has felt discontented with the absence of the day for elderly people, although there were the Boys' and Girls' Festivals or Coming of Age Day. He kept appealing to the government and the prefecture for the establishment of the day for elderly people, and the day spread all over the country and was established as a national holiday in 1966. The mayor passed away at the age of 98 at an aged care facility this February. His grandchildren and great-grandchilden visited him every weekend. Missing centenarians has grabbed headlines this summer, but it has little effect on life expectancy. Because it doesn't cover men aged 98 or over and women aged 103 or over, and is calculated using a national census. Census takers visit every household, and distribute and collect census forms in person. As of 2010, people aged 65 or over accounted for 23.1 percent of the total population. Koseki (戸籍) is a Japanese family registry. Events such as births, deaths, marriages must be filed by family members. So no one updates a family registry if an entire family dies due to wars or disaster. My grandmother lived in a rural area. Most people in my grandmother's village share a common family name although they are not relatives. They always left the door unlocked. A hill was used as a shared grave site among the villagers. The hill were absolutely covered in weeds soon. Our gravestones were not visible externally due to bushes. To visit our grave, we had to cut off weeds along the path and clear our bushy grave of bushes. The villagers could choose a site for their graves on a first-come-first-served basis. As graves have filled in the open spaces, my grandmother was worried that she could not get her last resting place if she lived long. She lived to be 97 in peace after the renovation of the site. Some local governments send elderly people a gift to celebrate their longevity. Kouhaku manju are used as a congratulatory gift. My neighborhood association hands kouhaku manju to the people. These are covered with cellophane wrappers. 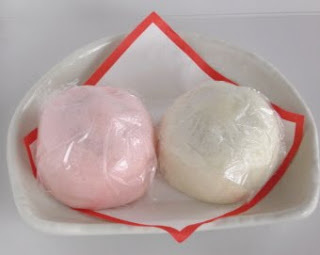 Manju has its origins in ancient China. According to legend, Shokatsu Ryou(諸葛 亮,Zhuge Liang in Chinese, 181-234) used head-shaped buns filled with beef or mutton as a substitute for Human heads to pay tribute to their god. It is said that Rin Jouin(林浄因) from China, a Zen Buddhist monk, brought it to Japan in 1341 and started to sell it as Nara-manju(奈良饅頭). It was filled with bean paste because the eating of meat became tabooed with the rise of Buddhism. It made a big hit with the emperor of that time. Rin Jouin married a court lady who was given by the emperor. They served kouhaku manju to people around them at their marriage and buried a pair of that manju in the ground to pray for prosperity of the family, and a stone in the shape of manju was placed there. So that manju became a festive confection. His descendants set up a shop in Kyoto, but they moved to Shiose village(塩瀬村) in Mikawa to escape the fighting. The shop name was changed to Shiose, the name of the village. They moved to Edo and Their shop enjoyed prosperity under the patronage of Tokugawa clan in the Edo Period. In the Meiji Period, they became a purveyor to the Imperial Household. Now their main office named Shiose Souhonke(塩瀬総本家) is located in Chuouku Ward(中央区) of Tokyo. Rin Jinja shrine(林神社) was built to honor Rin Jouin as the god of manju in 1949. Japanese-style confectionery manufacturers throughout the country hold its annual festival on April 19th, the anniversary of Rin Jouin's death. Okina means a old man. Jelly-like confection containing starch syrup, sugar and kanten(agar).